KitchenAid has been serving up kitchen appliances for nearly 100 years. Founded in 1919, the company’s first product to market was a stand mixer. You know their iconic logo? Yup, that’s the silhouette of KitchenAid’s early beginnings. What I really love about KitchenAid products is their design and construction hearken back to those early-1900s roots. Which is the best KitchenAid coffee grinder? Objectively it’s the KCG0702, but the best model for you may be one of the other two. Without further ado, let’s turn to our handy comparison table. Let me get this out of the way: I’m a sucker for KitchenAid’s awesomely retro design and sturdy die-cast metal construction. The KitchenAid capsule-based Nespresso machine? Easily one of my personal favorites. Design aside, the KitchenAid KCG0702 burr grinder is a high-quality model from a reputable brand. 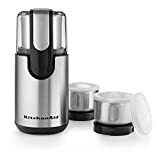 It’s KitchenAid’s only conical burr grinder, which easily makes it worlds better than the blade grinders below. Burr Grinders vs Blade Grinders: What’s the Difference? Burr grinders actually grind your coffee to the desired size. You want a fine grind? The burrs are aligned closer together to grind the coffee beans until they’re small enough to fall between the two burrs. There are two types of burr grinders — conical and flat — which have differences of their own, but they’re both vastly superior to blade grinders. The major benefit of burr grinders: A more even and consistent grind for a more predictable and balanced extraction process. Blade grinders are like a food processor or blender with a spinning blade that pulverizes coffee beans by sheer force of impact. Unlike burr grinders you can’t do anything to set the grind size except chop for more or less time. The resulting ground coffee lacks any consistency in size and produces an inferior cup of coffee. The major benefit of blade grinders: They’re much cheaper. 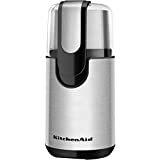 So we’ve established that the KitchenAid KCG0702 is a stainless steel conical burr grinder, which automatically makes it the best KitchenAid coffee grinder on the market. What else should you know about this KitchenAid coffee grinder? It has a rather small bean hopper capacity. This can be either a pro or a con depending on your perspective. For me it’s a pro. The smaller capacity means it takes up less space and I get to refill it more frequently with fresh coffee beans stored away properly! If you don’t like refilling your bean hopper as often, maybe this is a con. It isn’t portafilter compatible. Some coffee grinders, like the DeLonghi Dedica KG521, allow you to attach a portafilter for seamless filling before every use. The KitchenAid KCG0702 doesn’t have that functionality. Now, that doesn’t mean you can’t just hold the portafilter under the grinder while you dispense the desired volume of freshly ground coffee (you absolutely can) but there isn’t a specific design feature accommodating it like other models have. The ground coffee container is oddly shaped. Yes, it’s aesthetically pleasing, but I find it functionally flawed. I brew with an Aeropress and grind a single serving of coffee every time. It’s very hard to scoop out every last bit of coffee grounds with your standard scoop, and the glass container’s shape isn’t very conducive to pouring into my narrow Aeropress. If you’ll be grinding enough for whole pots of coffee, this point is moot. But for precision grinding, it’s a little cumbersome. Depending on which color you get, the model number will append the letters in parentheses above. So an empire red model will be the KCG0702ER. Overall, the KitchenAid KCG0702 burr grinder is worthy of it’s great reviews on Amazon and has all the features you’d want in a quality coffee grinder. For those who want a quality burr grinder with great durability and proven performance, you’ll like the KitchenAid KCG0702 burr grinder. While the price on these machines fluctuates frequently, I will say it’s a little overpriced (likely because of the die-cast design, which again I do love). For a similarly high quality grinder that’s usually a little cheaper, check out the Baratza Encore. Related: Baratza Encore vs Virtuoso: Which Is Right for You? If you’ve never owned a coffee grinder before, can’t tell the difference between mediocre and great coffee, or want a cheap KitchenAid coffee grinder, look at the two models below. Notice I didn’t say “ground coffee” because that’s not what this is. It’s very obviously chopped. You’ll have an amalgamation of coarsely chopped coffee perfect for french roasts, medium ground coffee perfect or pour over, and plenty of fines like you’d want for espresso. Because of the grind size inconsistency, this grinder isn’t going to give you a great cup of coffee. But that’s not why you’re considering the KitchenAid BCG111. You’re considering it because it’s cheap, small, and easy to operate. The KitchenAid BCG111 is for you if you want something cheap, small, and easy to operate. If you’re looking to up your coffee game, you definitely want to save up and buy a decent burr grinder. While I hate to suggest that higher price equals better quality, with low-to-mid-priced burr grinders that’s sort of the case. At least get something over $70. But if you just want a convenient coffee grinder pulverizer, this model is a great bet for its affordable price and great durability. As a blade grinder, it’ll give you a very uneven grind. Quality is the only con here, but it’s a big one. The gap between a burr coffee grinder and a blade coffee grinder is Grand Canyon-esque. They’re barely even in the same stratosphere. The KitchenAid BCG211 is the exact same grinder as the KitchenAid BCG111, so scroll up a few inches for some additional images and my thoughts on that blade grinder. So what’s the difference between the BCG211 here and the BC111 above? The KitchenAid BCG211 comes with two spice grinder accessories. Each spice grinder accessory is a stainless steel attachment that replaces the main coffee grinder apparatus. The spice grinders have a 2 oz (57 g) capacity with specially designed blades for finely grinding spices. It’s not grinding, it’s pulverizing. As a coffee drinker, when would you need the included spice grinders? Like above, these spice grinders aren’t going to give you that consistent grind you want for Turkish coffee. You can get this kind of Turkish grinder for coffee (or spices!) for an extremely affordable price. Like the KitchenAid BCG111 above, the BCG211 is for those who just want the cheapest means of grinding their coffee…but who also want top grind even finer with the included spice grinder attachments. Neither the coffee grinder nor the spice grinders will give any sort of consistency, but they will turn whole bean coffee into crushed coffee that’s fine enough for brewing.